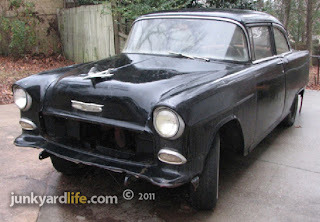 1955 Chevy Nomad dream car, parts car or project. BTW its not for sale. Photos by Rob Butler. 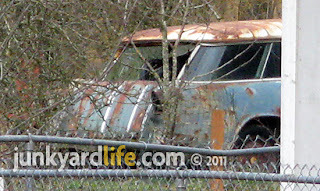 1955 Chevy Nomad yard art. 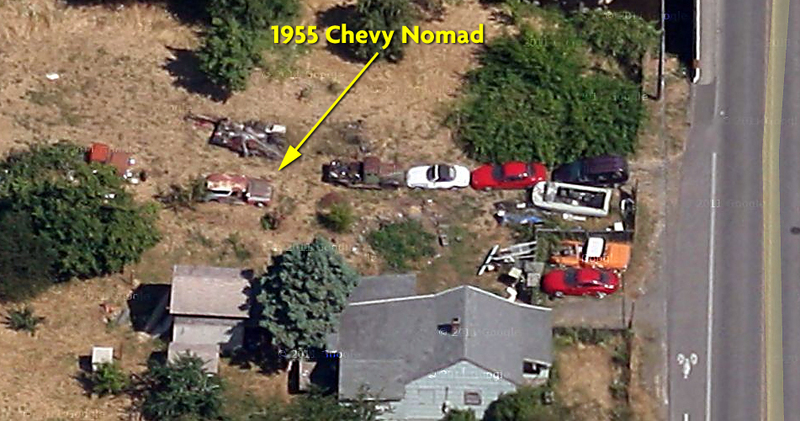 Milwaukie, Oregon's Rob Butler spotted this rare 1955 Chevrolet Nomad languishing in a yard recently. Butler, an automotive cartoonist, who founded Sasquatch Artworks and is known as ‘Rob the ToonMan,’ was quick to recognize the abusive relationship this Nomad represents. An owner mindless to protect a classic car from the elements and steadfastly unwilling to sell it. As painful as it is to see any Tri-Five Chevy suffer needless neglect, witnessing a ’55 Nomad die execution-style warrants a call to the Oregon governor. Can I get a blindfold? Looks like Shoreline Beige roof over Glacier Blue on this ’55 Nomad. Gypsy Red fenders were not part of the 1955 color combo options. GM built around 8,500 Bel Air Nomad two door station wagons for the 1955 model year and their values are soaring. 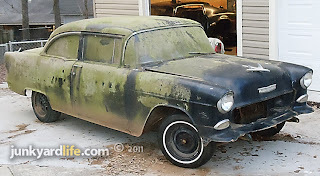 According to Collector Car Market Review Value Report 1955 Chevrolet Bel Air Nomads are not cheap, even when they are in #5 condition. That means they need a complete restoration. Aerial view courtesy of Google. 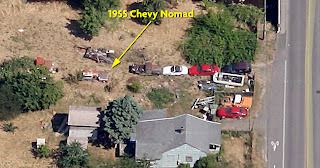 See map of ’55 Nomad location. Original Nomad tailgate skins along with any Nomad-specific parts are tough to find. 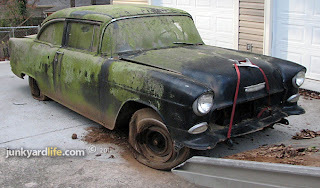 If your willing to travel to Oregon and make the owner an offer he can't refuse, maybe, just maybe, you can save this 1955 Nomad. 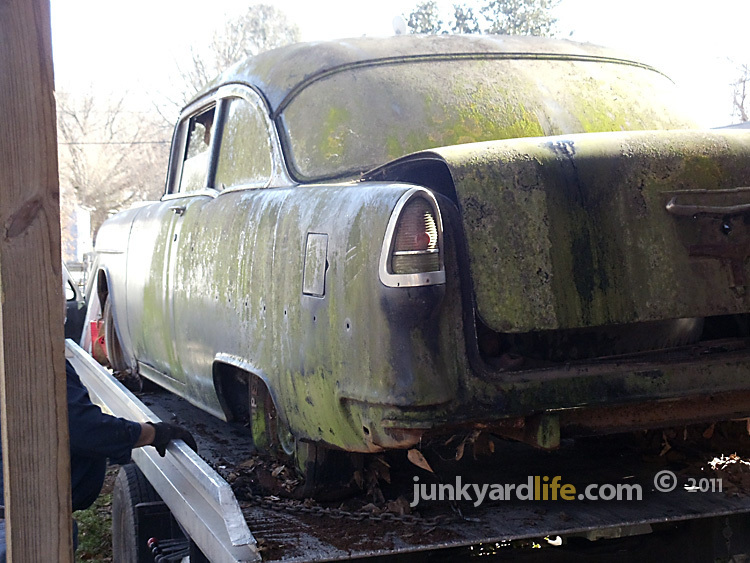 Future generations of hot rodders will thank you for saving a piece of history. 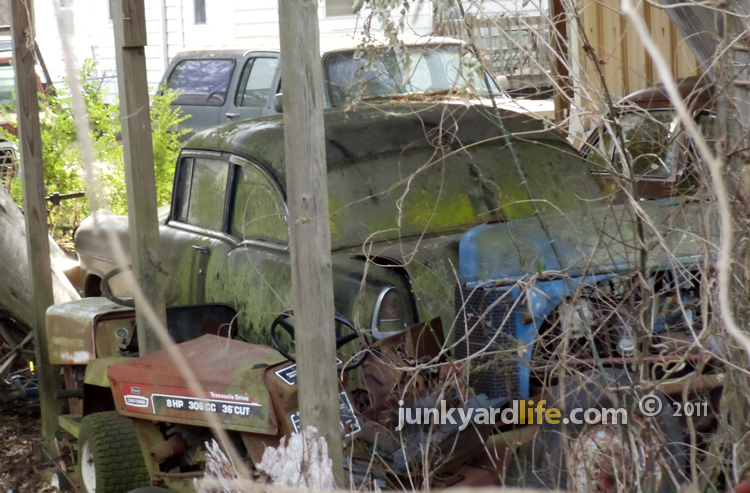 More junkyardlife Nomad info here. H.A.M.B. forum about these photos here. Nomad, no doors. Still cool. 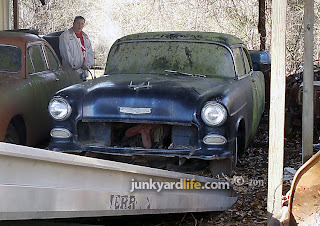 The first ’55 Nomad on junyardlife's Cars in Yards. 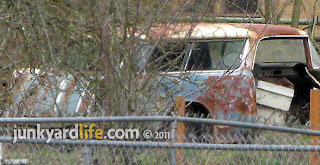 Have you spotted a cool old car in the weeds? Got one you want to show off? 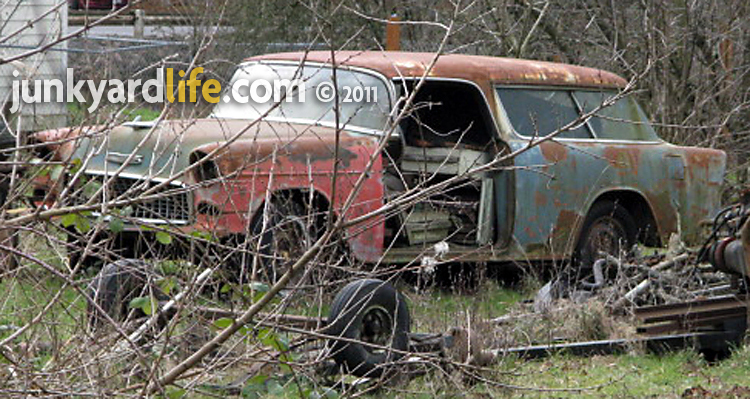 Striking barn-find-gold with a 1955 Chevy. 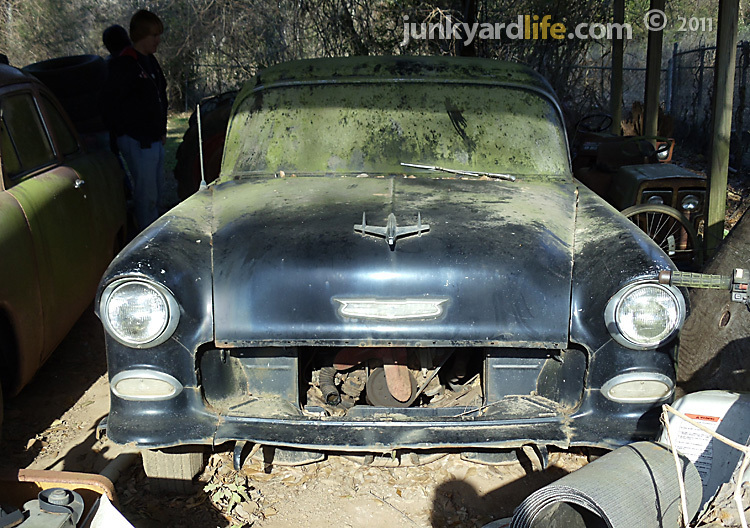 Finding a decent Tri-Five Chevy project car is rare, let alone finding one that was hot-rodded in the 1960s then parked almost 40 years ago — with all the go-fast goodies intact it's like finding buried treasure. Ron Kidd discovered this black ‘55 Chevy tucked away in a backyard and managed to work out a deal with the reluctant seller after several years of negotiations. 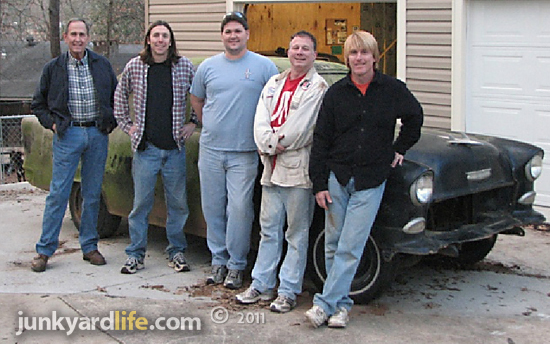 Here is a barn find story that could happen to you. This 1955 Chevy Bel Air was hot rodded and raced on Alabama drag strips in the 1960s. I love barn finds. I adore barn finds. 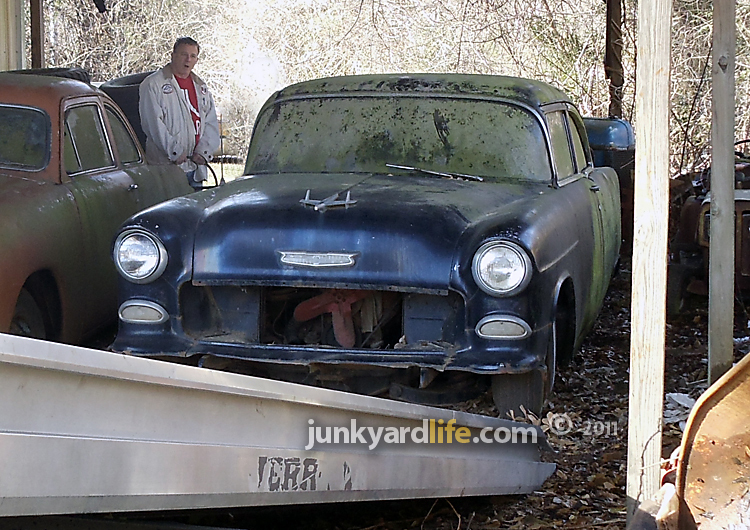 I love the history and the mystery that every discovered automotive treasure holds. 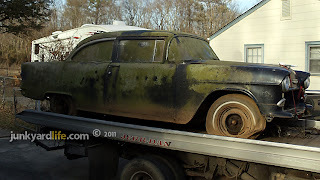 I found this 1955 Chevrolet on a carport in North Alabama and it is a great example of what we at junkyardlife spend our days dreaming about. The main difference is once my heart stopped pounding and I regained composure, I said sternly to the Chevy “You’re coming with me!” And he did. Only not that day. It took a couple of years worth of waiting and pacing the floors until a deal was made. And here is what I brought back to Ron the "Earth Roaming Car Guy’s" Tangled Web of Automotive Euphoria-with the help of friends, of course. 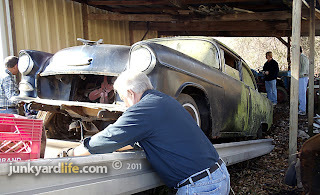 Ron Kidd looks on in disbelief that he actually owns this barn find '55 Chevy. The first-time this Bel Air Chevy has moved in decades. It is a 1955 Bel-Air Post Sedan. It rolled out of Chevrolet covered in a solid India Ivory White (code 593) with blue interior (code 509). It was a six cylinder with a manual three speed transmission. I learned that they did indeed make a Bel-Air with the post. They made 168,313 of them, and this one’s mine! It currently has a 327 from a 1964 Impala, a set of awesome 462 casting double hump heads and a Saginaw T-10 4-speed transmission! Painted a classic black it makes you want to watch “American Graffiti” over and over. It is missing bumpers, radiator, outside mirrors, the entire rear back seat, grill, the side Bel Air trim and what’s not missing may need to be replaced. We don’t care. We are in love with this beautiful hunk of American street history. 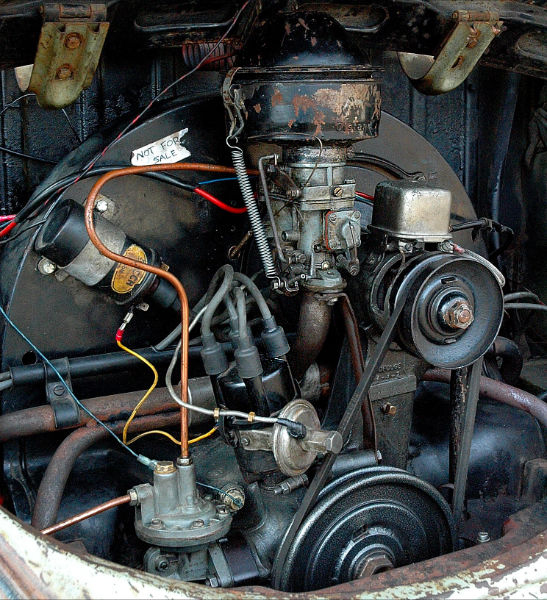 The '55 housed a 327-cubic-inch Chevy V8 engine with #462 double hump heads. The ‘55 was purchased new near Birmingham, Alabama by an older lady who sold it to second owner’s family in the mid-to-late sixties. 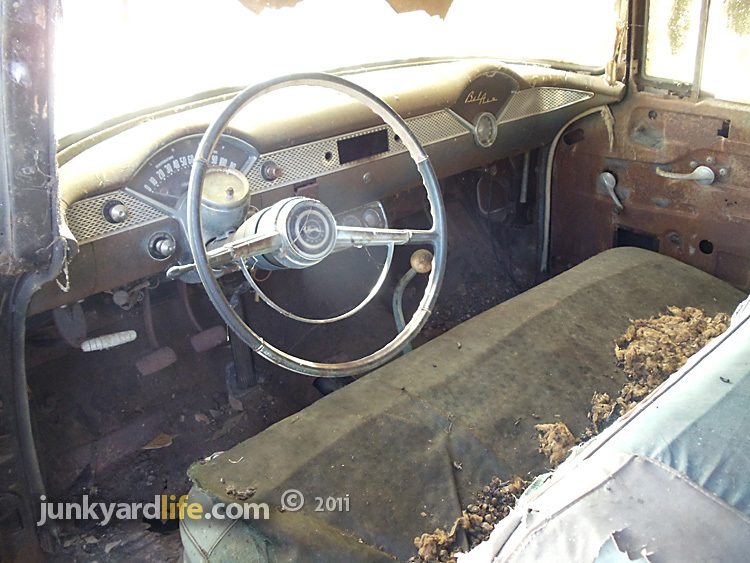 At some point in the car’s life, it was painted Turquoise and white with matching interior. During the second family’s ownership of the car, it became a lady name Dianna’s first car. Later, it became her husband Ronnie’s hot rod during the late sixties to early seventies. During that time it received the hot headed 327 cubic inch V8 and the four-speed. It was painted black and raced at Lassiter Mountain Dragway near Birmingham, Alabama. Ronnie’s brother-in-law, Curtis, who had just returned from Vietnam, borrowed the ‘55 and went on a date in it in 1970. Engine woes forced it to be parked under a shed, where I (Ron) spotted it about five years ago. The '55's trunk had been left open, for who knows how long, helping preserve the quarter panels and trunk pan from the moist environment of its dirt parking spot. 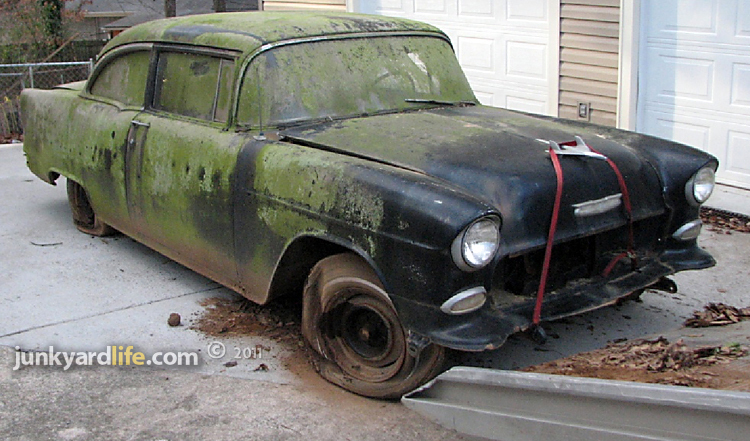 The 1955 Chevy slid, not so much rolled, off the flatbed wrecker. Debris falls off Chevy after landing at its new home. The wheels and tires were replaced soon after the '55 was dropped off wrecker. The 1955 Chevy in "Two-Lane Blacktop" had a rear bumper. 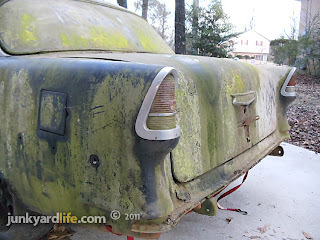 Dig that barn find patina? Rims and tires added to help roll the Tr-Five into garage bay. Despite the fact that Chevrolet produced more Bel-Air 2-door Hardtops (185,562) than Post Sedans (168,313); the non-post Hardtop cars remain the most desirable. 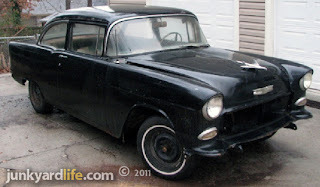 The Black 1955 Chevy street racer from “American Graffiti” was the same car used in “Two-Lane Black Top.” Driven in “Graffiti” by Harrison Ford and driven in “Black Top” by contemporary music legend James Taylor. The above mentioned movie car was owned by the studio and was brought back out to make sound effects for the 1977 hit movie “Smokey and The Bandit” staring a beautiful 1977 Special Edition Trans Am. I don’t know how I feel about that. Ron Kidd is fired-up about his project '55. 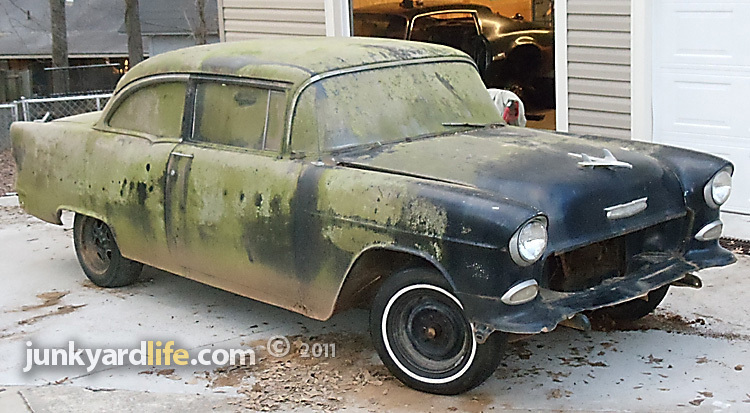 So what’s it going to take to make this '55 hit the streets where it belongs? I am going to take it off the frame and do floor pans, bushings, mounts, fuel lines, brake lines and frame coating to make this last another lifetime (mine hopefully). Notice the Hurst shifter curling over the bench seat? 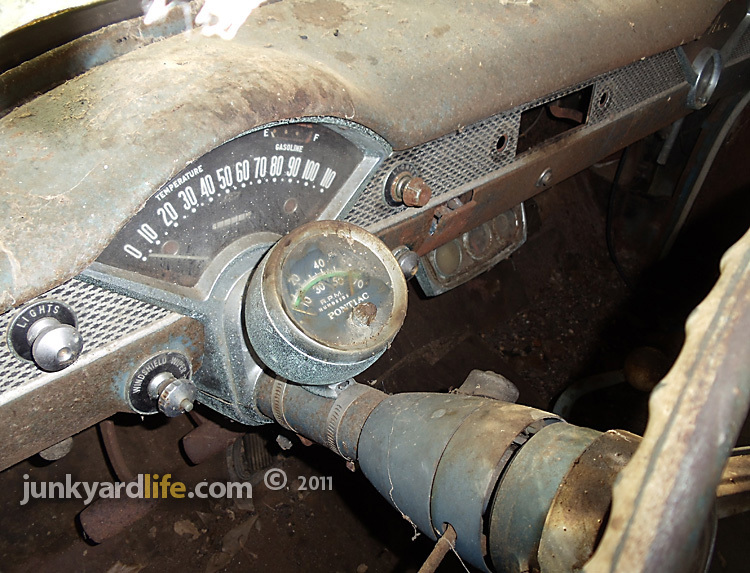 I am going to replace the entire wiring harness to avoid any fires and add power brakes and air conditioning. The 4-speed will relinquish its spot for a 6-speed to take advantage of some good over-drive. As far as the engine goes... heck, if I know. Seeing as this 327 engine is locked up tighter than Fort Knox, something has to go in its place. 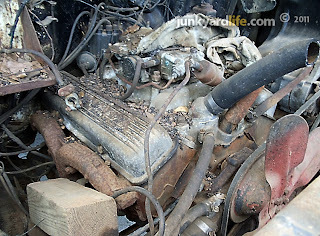 Part of me wants a “Two Lane Blacktop” big block rat motor with a lumpy cam and a thirsty Holley. Another part of me says I can make huge power from a stroked small block Chevy. Pump gas and dependability are important. I also want to incinerate both rear tires at will when the notion hits me or a pesky Mustang entices me. 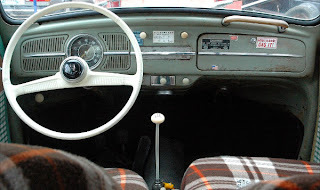 An early-sixties Pontiac tach is strapped to the 55's steering column. In this frame of mind today, as of this writing, the car will be repainted a nice evil black. Not quite gloss, but not dull either. As far as rolling stock – my first choice will be a set of polished aluminum slotted mags and a fat pair of Mickey Thompson tires out back. My second choice would be a set of black steelies with a set of poverty dog dish hubcaps and black wall tires. Third choice is a set of Chevrolet Rally Wheels with the small center piece and white letter BFGs all around. Hot Rod Hearts indeed. 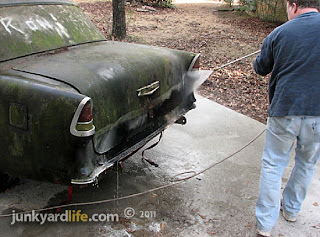 Simple Green, a pressure washer and a junkyard galoot willing to get soaking wet on a 40-degree day washing his barn find 1955 Chevy Bel Air. After the first bath in 30-plus years, the "Two Lane Moss Top" turned into a black beauty. Project '55 Chevy is in full swing. Wrenches are turning on it as we speak. '55 Chevy Barn Find Rescue Team – (L to R) Joe Potter, Jody Potter, Jason Trammell Ron Kidd and Anthony Powell. 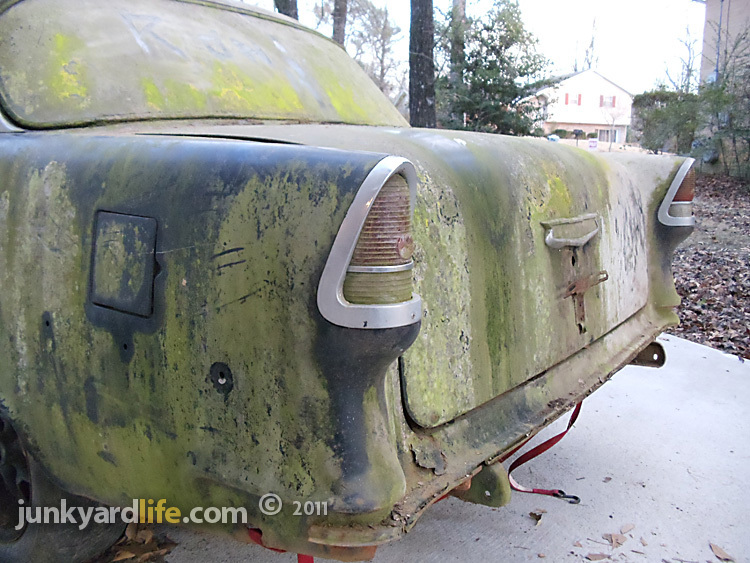 This junked 1959 Euro Spec VW bug received a new lease on life courtesy of a 3-year-old kid. 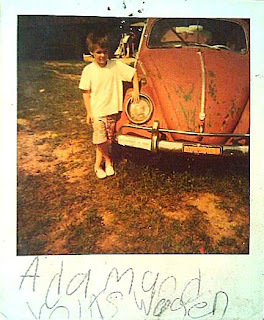 Aunt's wrecked Bug leads to rare VW find and Beetle fan for life. Adam Simpson, 25, of Bessemer, Alabama discovered his dream car when he was three years old. 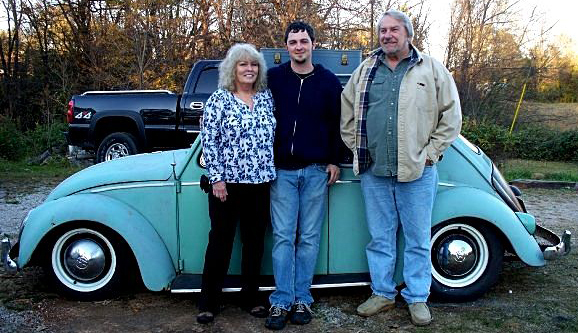 The 1959 European Spec VW Beetle that his grandparents purchased for $60 in 1988 was just what Simpson wanted. It didn’t have seats, the paint was peeling but it was the perfect playhouse for his imaginary road trips. Now Simpson remembers those childhood road trips through the windshield of his daily driver. That $60 1959 VW Beetle. Adam Simpson in 1991 with his $60 1959 VW. Simpson's VW has a budget-minded rattle can paint job. European Spec VW in Alabama? An article in ‘Hot VWs’ magazine clued a then 12-year-old Simpson into the fact that his old playhouse was a 1959 European Spec Beetle. European model VWs were equipped with semaphores, flip-up turn indicator lights on the door posts. 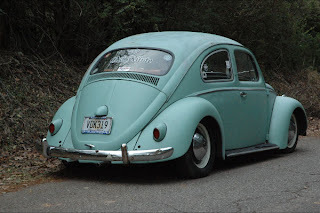 U.S. cars stopped using these in 1955 but in Europe VWs had them through 1960. Also, in 1958, the rear window on VW Beetles went from an oval to a square shape along with many other big changes. Simpson says his VW is rare because there were only three years for big window VW semaphore cars. He sent the VIN number to VW in Germany and received his Bug‘s birth certificate. “It was built on June 29, 1959, with its original home being Freiburg, Germany,” Simpson said. “How it ended up in Bibb County, Alabama, in 1988 is a mystery.” An old Marines sticker on the front bumper might offer a hint. Many European VWs made their way stateside via servicemen. Not long after Simpson reached driving age, he began tinkering on a pair of VW buses. He gained valuable hands-on experience working on the buses, which had been sitting for over two decades. By 2008, Simpson had become proficient at wrenching on VWs, so he decided to get serious about resurrecting his old ‘59 VW. Simpson dug in and discovered his ‘59 Bug had very little rust but had sustained some heavy wreck damage. “It’s had a pretty hard hit in the left front at some point as well as one in the right door,” Simpson said. “I know this bug hasn’t lived a pampered life. I’ve had to junkyard and swap-meet it back together. Basically, if it’s bolted on, I’ve replaced it." Simpson replaced the brakes, cleaned out the gas tank and and fought gremlins in the modified electrical system. “I stayed with the original 6 volt system. The headlights are plenty bright and it starts up without an issue,” said Simpson. A large VW parts stash helped Simpson make short work of overhauling his basket-case Beetle. By the fall of 2009, he had the Beetle in driving condition. Simpson's 36 HP aircooled Volkswagen engine hasn't set any land speed records yet. 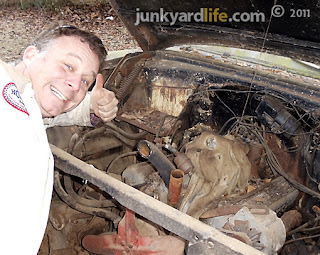 Simpson’s $60 VW had a 1965 model 40hp engine that was seized with a big crack in the case. Simpson replaced the engine with a correct 1959 VW 1200cc 36hp engine. That engine ran well but developed a bit of end play after a few months. 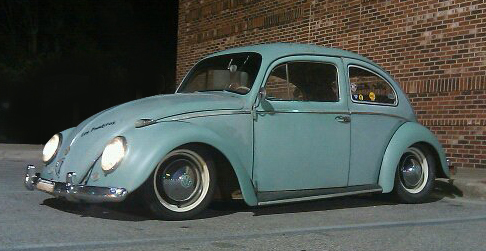 Simpson bought a running longblock out of a ‘58 VW from a friend in July, 2010. He transplanted engines and tested the limits of the V-Dub's 36 hp powerplant. “She’ll do an honest 75mph and that’s GPS verified,” said Simpson. “Who needs to go fast to have fun anyways?" 1959 Euro Spec VW interior in plaid. What is negative camber? When tires are angled inward at the top just like Simpson has on his '59 VW's swing axle rear suspension. 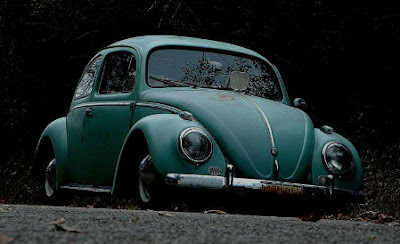 Simpson wanted his Beetle lowered or slammed to the ground a bit. He had a friend build a 5-inch narrowed axle beam with adjusters and drop spindles to lower it 2-½ inches. For the rear, Simpson turned the spring plates up one notch to give it some trademark VW swingaxle camber. Simpson chuckles when ‘those not in the know’ ask if his VW’s axles are broken. The wheels are stock with 145/65/15's in front and 165's out back. Simpson likes VWs on stock wheels. You get the vintage look and it’s cheaper than buying rims. Simpson is not finished building the VW that was his childhood playhouse. He wants to replace the interior with factory 1958-’59-only interior and eventually paint it Mignonette Green, its original color. Replacing the front apron clip and installing a ragtop sunroof clip are also on Simpson’s to-do list. A correct “split case” transmission may someday find a home in his VW as well. Adam Simpson, (center), with his grandparents, Susan Simmons and Gene White.